This book review is on the request of our reader Smita. On a lazy saturday evening, with no one at home, I started reading Agatha Christie's 'And then there were none' with a bowl of maggi (instant) noodles and entered the mysterious world of Soldier Island. I have to stress at this point that this setting spooked me and in turn made me enjoy the book. The book tells the story of 10 perfect strangers, brought together on an island shrouded by mystery, to spend a week together. Each character's story is told in crisp 1-2 page monologues and that forms the premise. And then on the first day of stay itself the deaths start. Not only are the deaths preposterous, but they follow a pattern. A pattern illustrated by a poem (10 little soldiers). The deathly events continue and the survivors try to unravel the killer. What happens is an intriguing story of psycho-mania, justice and cold-blood. The story is fast paced. It took me hardly 3 hours to finish. There are no major plot holes. Agatha Christie is a master at that, I think. Few characters had an element of intrigue, which made me as a reader think about situations in their life and take a decision. But as an observer I kept wondering about the real/detailed stories of the 10 protagonists. May be more details would have made the story richer. But as a thriller the book worked perfectly well for me, because I slept with lights on that night. Also I read an Agatha Christie after 8 years!! So this experience also made me nostalgic. So thank you smita for the request and in turn making me re-live school days. I hope if you read the book, you enjoy it as much as I did. whoa! u read it in 3 hrs?!! if its a quick read then i would like to get into it cuz at d moment i am just not in d mood for heavy books. i like d concept of people on an island dying one by one. :P i have started this other book by agatha christie, hope i finish that soon. The name of the book has always always intrigued me! :D And uff, the story sounds good enough to give heebie jeebies. Is it like Saw? Or Lost? Finished a 315 page book in 3 hours?? Whoa :D Lovely review!! I always wanted to read this one, the name intrigued me much. Now your review has made me want to read it even more. Am reading the Quin mysteries by Christie, you read? And I do agree that she is a master at story telling, never found a loop hole in her tales. I've only ever read The Mirror Crack'd. 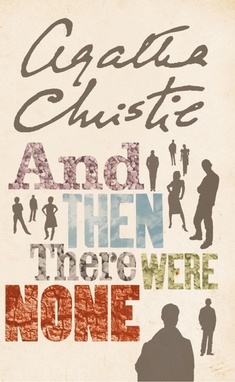 I really need to read some more Agatha Christie. arpita - thanks :) yes it was a quick read, I guess the setting really helped me move so fast! swarnali - haven't read them. But will add to my reading list :) thanks btw! ryan - yes they are fast and satisfactory reads! give them a try.